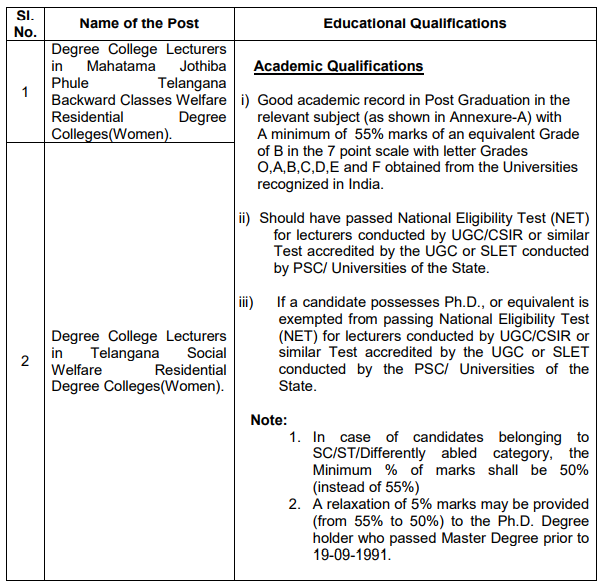 Telangana State Public Service Commission (TSPSC) invites Online Applications from qualified women candidates through the proforma Application which will be available from 06/06/2017 on Commission’s WEBSITE (www.tspsc.gov.in) to the post of Degree College Lecturers in Residential Degree Colleges(women) .Telangana State Public Service Commission is the youngest Public Service Commission in the country constituted vide GO Ms No.43, GA(Ser.A) Department, dt. 8.8.2014. Total numbers of vacancies are 546 Posts.Refer Notification No.22/2017, Dt.02/06/2017.Only those candidates are eligible who have passed Post Graduation in the relevant subject (as shown in Annexure-A) with A minimum of 55% marks of an equivalent Grade & passed National Eligibility Test (NET) for lecturers conducted by UGC/CSIR or similar Test accredited by the UGC or SLET conducted by PSC/ Universities of the State. A Candidate should not be born after 01/07/1999. A candidate should not be born before 02/07/1973. 1.The Preliminary (Screening Test) of Objective Type and is likely to be held on Dt.16/07/2017 and the Main Examination (Objective Type) is likely to be held on 12 OR 13 /08/2017. Apply Online at the Telangana State Public Service Commission (TSPSC) website before 24/06/2017.